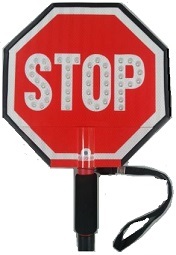 LED Bright-light STOP/STOP Paddle with reflective 3M Engineer Grade Prismatic background. Can be seen for a mile. Three settings: Blink, Steady or Off. Comes with lithium-ion battery and charger kit. One-year warranty. Light-weight: 12-inch is 1.2 lb and 18-inch 2.1 lb.